With easily interchangeable drums, the Speedrooter XL gives you long distance clog-busting power in 3″ to 10″ lines – up to 200 feet. The rugged, easy-to-maneuver Speedrooter XL sports a powerful 3/4 hp motor to drive the cable down long runs and clear tough stoppages. Change drums to add cable lengths or swap cable sizes with ease. Just loosen three knobs and remove the drum. Switch between 3/4″ or 5/8″ Flexicore cables in the large drum design – General’s see through inner cage lets you quickly gauge how much cable remains – or substitute the small drum with 100 feet of 1/2″ Flexicore cable for smaller lines. Variable speed cable feed offers raw driving and pulling power for long, tough jobs – feeding and retrieving 3/4″, 5/8″, and 1/2″ cables. To adjust for each cable size, simply turn a knob on top of the feed – no screwdriver required! Clears 3″ through 10″ drains up to 200 ft. down the line. Large drum holds 100 ft. of 3/4″ or 5/8″ Flexicore cable. Small drum holds 100 ft. of 1/2″ Flexicore cable. Inner drum cage protects against cable tangling. 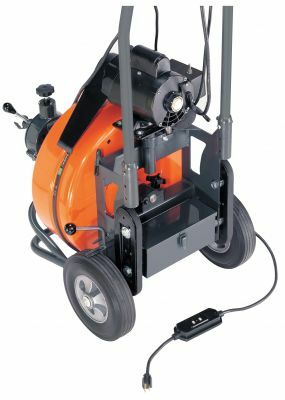 Variable speed Power Cable Feed drives and retrieves cable at up to 20 ft. per minute. Features stair climbers, 10″ ball bearing tires, truck loading wheel and tool box. Power 3/4 hp motor provides clog-busting power. Adjustable height handle can be 3″ taller or more compact. Flexicore wire rope center cables have unequalled strength yet the right amount of flexibility. Greatly increases the efficiency of power cable feed by reducing cable whipping and drag. Keeps your hands off of the spinning cable. Tube is 30″ long. Five foot extensions are made of rigid conduit with a flexible spring end. Equipped with 10″ heavy-duty wheels, stair climbers, tool box, and ground fault circuit interrupter. 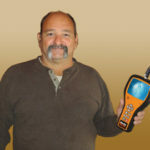 One person easily loads the Speedrooter XL onto a truck. 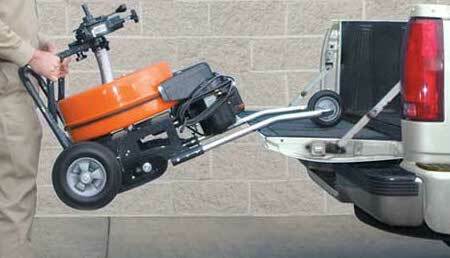 The swept-back handle and loading wheel give you the needed leverage. 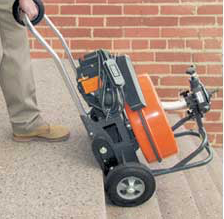 V-belt stair climbers like the ones used to move heavy furniture and appliances let you take the Speedrooter XL up a flight of stairs yourself. 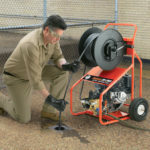 With easily interchangeable drums, the Speedrooter XL clears tough clogs in 3″ to 10″ lines – up to 200 feet. A large drum holds 100 feet of 3/4″ or 1/2″ Flexicore cable. For smaller lines, you can switch to a small drum (optional) that holds 100 feet of 1/2″ Flexicore cable. 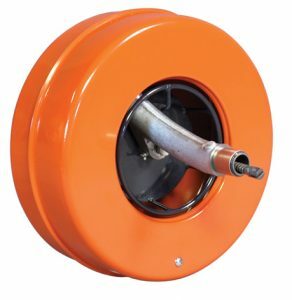 Large drum holds 100 ft x 3/4″ or 5/8″ cable (30 m x 19 mm or 17 mm). Loosen three knobs and lift drum off. 3/4 hp with capacitor, forward-off-reverse switch, 20 ft. power cord and ground fault circuit interrupter. Pneumatic, with no electrical contact between pedal and motor. Drives and retracts at variable speed of up to 20 ft. per minute. 10″ semi-pneumatic heavy duty with ball bearings. Heavy-duty V-belts running on nylon rollers. Keeps machine in place on the job or in the truck. Enables one person to lift machine onto bed of truck. Attached to rear of machine. Holds all cutters except Flexible leader. With double-reinforced palm for hand protection when guiding cable. 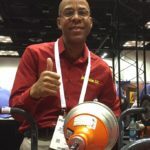 Left wound Flexicore® wire rope center 3/4″ diameter for 4″ to 10″ lines and 3″ lines without sharp bends; 5/8″ diameter for 3″ to 6″ lines; 1/2″ diameter for 2″ to 3″ lines.